This weekend is packed with cultural and charity events. 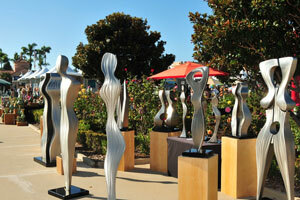 Find food, art and live music all weekend at the 10th annual ArtWalk NTC @ Liberty Station. The festival is produced by the same team that brings the popular Mission Federal ArtWalk to the streets of Little Italy every spring, and more than 200 artists will have their work on display on the lawns of Liberty Station's Ingram Plaza (where the flag pole is located). Every medium will be featured, from oil paintings and sculpture to photography and jewelry. The artists hail from both the San Diego area and abroad, and this year's featured artist is Inocente -- who was a homeless, undocumented immigrant here in San Diego when she was just 15 years old and dreamt of becoming an artist. Her life story was featured in a documentary short in 2012, which won an Academy Award the following year. "We are thrilled that Inocente chose ArtWalk to showcase the new art she has been working on," Sandi Cottrell, ArtWalk San Diego's managing director, said in a statement. "Her message perfectly aligns with one of our core values, which is to make art education available to all kids through ArtReach. Inocente's moving story illustrates art's value for young people." Children are welcome at the event, and there's plenty of activities for them to engage in. The KidsWalk section has face painting, henna and letter brush painting, and a station where they can make flowers out of recycled materials. For adults, the beer and wine pavilion will have draft beer from Stone Brewing Co. and wines from Francis Ford Coppola Winery's Diamond Collection. All guests are welcome to participate in the collaborative mural presented by FARM Creative Market & Art School, a new art school that just opened in Liberty Station. The ArtWalk is Aug. 15 and Aug. 16 from 10 a.m. to 6 p.m. at 2645 Historic Decatur Road. Admission and parking is free, many of the art work and jewelry on display will be available for sale. Visit www.artwalksandiego.org/ntc for more information. It won't be a fashion faux pas to wear gladiator sandals tomorrow night if you're heading to Little Italy's Amici Park. The park at West Date and Union streets will transform into a themed party celebrating the ancient city of Pompeii, Italy, for the fourth annual Ferragosto fundraiser from 5 p.m. to midnight. Guests are encouraged to party like it's 79 A.D. by coming dressed in a toga -- but think Roman nobility, not "Animal House." Inspired by the Italian holiday Feriae Augusti, a national public holiday on Aug. 15, this year's Ferragosto will have circus rides, live entertainment and plenty of food from local restaurants such as Monello, Isola Pizza Bar, Kettner Exchange, Café Italia, and Bencotto. Raffle tickets offer guests the chance to win a trip to Italy or next year's Super Bowl. The fundraiser helps support Washington Elementary School Foundation, Our Lady of the Rosary Church and the Little Italy Association. Tickets are $115 for general admission, $165 for VIP. For information visit ferragostosd.org or call 619-234-4820. A two-week motorcycle ride spanning several states to raise money for AIDS research and HIV prevention ends in San Diego tomorrow with a celebration at Fashion Valley Mall. Kiehl's sixth annual LifeRide for amfAR started in Denver on Aug. 4 and crossed through Salt Lake City, Las Vegas and Los Angeles with 15 riders. The final stop is at Fashion Valley Mall, and the public is invited to welcome the riders from noon to 1 p.m. at the Kiehl's store. Enjoy complimentary bites from Soda & Swine, beverages from Juice Saves and skincare treatments from Kiehl's, a cosmetics company that was founded in New York in 1851. Chris Salgado, Kiehl's USA president, will present amfAR with a $150,000 check, and the store will offer 15 percent off all purchases. Kiehl's is on the mall's lower level, between Macy's and Louis Vuitton. For more information visit kiehls.com. After the successful launch of its "Munchie Meals" in 2013 and being declared "King of Late Night" by the Huffington Post, San Diego-based Jack in the Box continues to introduce indulgent and irreverent menu items, two of which made its debut recently: The Portobello Mushroom Buttery Jack and Spicy Nacho Chicken Munchie Meal. The Portobello burger is the third burger in the company's Buttery Jack line, which uses a "gourmet bun" that resembles a brioche. A quarter-pound beef patty is topped with melted garlic butter, Portobello mushrooms, grilled onions and Swiss cheese, and the bun is also slathered in peppercorn mayonnaise. 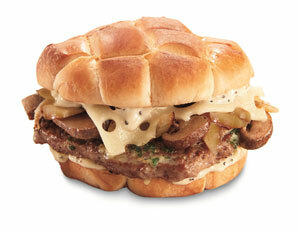 The denser bread seems to prevent the burger from getting soggy, despite all the butter and extra sauce. When it first launched the Buttery Jack line this spring, the burgers' sales exceeded the company's expectations. The Spicy Nacho Chicken Munchie Meal, which is only served after 9 p.m., puts a spicy fried chicken patty, onion rings, jalapenos and nacho cheese sauce between two pieces of sourdough bread. It's the chicken version of the Hella-Peno Burger, a popular Munchie Meal menu item, but with more crunch. The meal comes with two tacos, a small soft drink and "halfsies fries" -- a mix of regular and curly fries -- for $6. Revenue at Jack in the Box (Nasdaq: JACK) is up 3.2 percent compared to the same quarter last year, and Wunderlich Securities gave the company's stock a "buy" rating on a research report it released Tuesday. Shares closed Thursday at $87.60.